In October 2001, Charles Bazerman, an affiliated scholar of the South Coast Writing Project and one of the world’s leading authorities on writing across the curriculum and writing in the academic community, delivered the keynote address to the Conference on Writing as a Human Activity at the University of California, Santa Barbara. 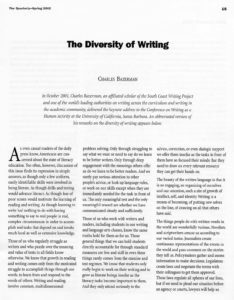 An abbreviated version of his remarks on the diversity of writing appears below. Those of us who regularly struggle as writers and who puzzle over the meaning and value of texts in all fields know otherwise. We know that growth in reading and writing comes only from the motivated struggle to accomplish things through our words, to learn from and respond to the words of others. Writing and reading involve constant, multidimensional problem solving. Only through struggling to say what we want or need to say do we learn to be better writers. Only through deep engagement with the meanings others offer us do we learn to be better readers. And we rarely pay serious attention to other people’s advice, or look up language rules, or work on our skills except when they are immediately needed for the task in front of us. The only meaningful test and the only meaningful reward are whether we have communicated clearly and sufficiently. But, we have, I believe, barely begun to understand how tenuous the relations are that we create by the thin line of words. People may or may not look at our words, and if they do it is with varying degrees of attention, from various stances, with various projects and interests in mind. Writing pedagogy’s early response to that fragility was to train and thereby reinforce sets of cultural judgments about some easily noticed features of texts that identified what counted as educated, intelligent writing worth attention or, conversely, marked ignorance, lack of cultivation, lack of intellectual and social class. Such training in social propriety offers a narrow target of acceptable behavior, of behavior that will keep a person within the social network, within the world of people who count, who are attended to, who are not excluded out of hand. It was a great step forward in our pedagogy and in our understanding of writing when we moved our attention back a bit from the page to the person struggling with it. Previously, such attention was granted only to those most securely accepted within the world of the literate, the highly esteemed literary artists, already authenticated as producing socially valued, meaningful text. Since we already knew that Hemingway’s writing mattered, the process of how he wrote it let us glimpse his genius. However, even Hemingway, we found, did not fill the page all of a sudden from an unsupplemented and spontaneous native gift. Even these works of genius were the products of extensive work over time. It was a further major step to turn our attention to all who struggle with writing. When we did that, we noticed that even the most easily stigmatized writers were more than that to which their too-easily-characterized traces on the page allowed them to be reduced. This was the startlingly magnetic message of Mina Shaughnessy’s work. In recognizing that even the most basic writer approached the task of writing with will and intelligence, we became more skeptical about traditional judgments based on the page. We also recognized that potential writers, beginning writers, basic writers, writing students, had more resources to draw on than we had given them credit for. Their abilities to think went deeper than the words they were putting on the page. We recognized that writers were diverse individuals with diverse ways of writing. The writing and language worlds in which our students actually participate, however, are far more diverse than dreamed of in the basic first-year writing course. We’ve learned that our students are variously motivated and influenced, that their past experiences and future plans shape their discursive worlds, as do their current engagements in other courses. The needs and lives of non-native English speakers and speakers of non-standard dialects have highlighted this diversity. Writing instructors and researchers also started to notice that working-class students who were the first in their families to access higher education stood in different relation to expressivist, individualist culture than did students raised in middle-class education-saturated, creativity-valuing households. We also started to notice the different dynamics at play in writing classrooms on different campuses—in a community college classroom where there was one primary industrial employer for the region or within the flagship residential liberal arts university in a state or at a large, diverse, urban commuter college. Considering one case, we can see that a report written by a social worker about a client is more than an objective representation of some easily determined state of affairs. It is a complex enactment of the social worker’s position within, attitudes toward, and attempts to work within the social services bureaucracies; it is an expression of his relations with his client; his understanding of how the current document will play out within the client’s file and in events that will follow as the document is read. The client record creates the institutional identity of the client with consequences for the future relations between the person and institution. All these realized activities and commitments are drenched with ideological representations, compliances, and resistances. Schooling, and particularly literacy education, is at the heart of the variety of modern life. Schooling allows children to enter literate worlds and careers far from the lives of their parents. Literacy education is at the core of the American mobility machine. Higher education especially is the great re-sorter of our society’s life chances. Now, when adults feel stuck in life, the most common cure, after buying a lottery ticket, is to return to school, to re-mix life chances through developing new spheres of literate skill and practice.